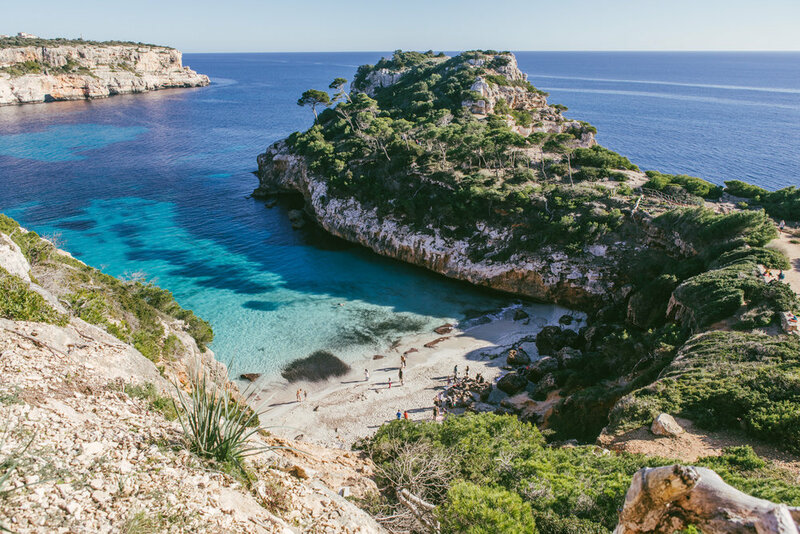 Let’s first start this article off with why you should travel to Mallorca, Spain in the Winter, when everyone raves about it in the Summer. Even though it certainly isn’t “Summer” weather, you still get the sunshine but without the overflow of tourists and crowds on the streets and beaches. As a result, you get to mingle with the locals, blend in with them (or not), enjoy plenty of space to spread your blanket on the beach sands, and peruse the markets, towns, and landmarks with ease. As is the case when traveling to most popular destinations during off-peak season, you can likely take advantage of lower price points for airfare and accommodations as well. That said, there are some downsides that you should be aware of before packing 5 bikinis and 5 sandals. Many of the popular shops and restaurants will have very limited hours of operation or will be closed entirely for the season, so don’t expect to get a prime seat overlooking the beach at the beachside restaurants. If visiting during the Winter holiday season, I suggest doing a big shop at either Carrefour or Lidl and doing most of your cooking yourself if your accommodation has a kitchen, as your dining-out pickings are slim outside of the island’s capital city of Palma. You’ll probably have to bring a coat or two, some warm socks and shoes, probably even a beanie and/or scarf (this isn’t necessarily a negative, it’s to be expected in Winter months, just don’t expect to feel like you’re on a tropical vacation in Asia somewhere), and the ocean water temperatures are only manageable for the boldest and bravest of us. Sadly, I am not one of those people. 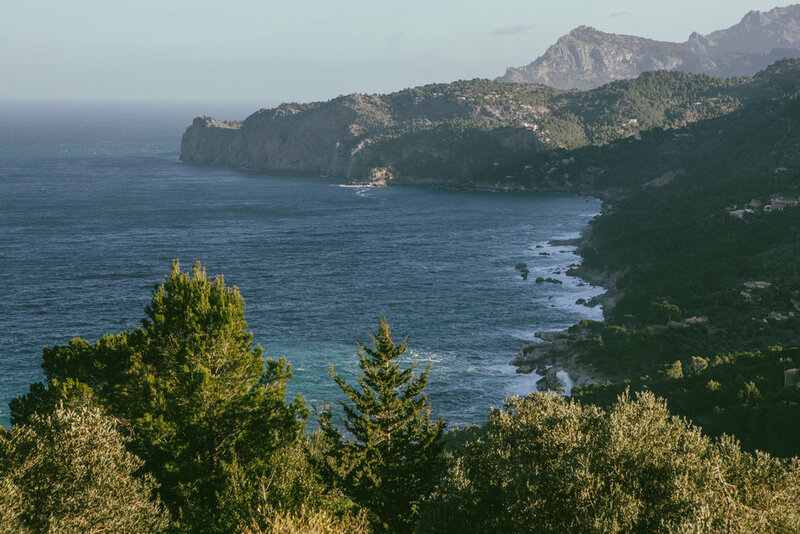 Nonetheless, Mallorca is a spellbinding place at all times of the year. 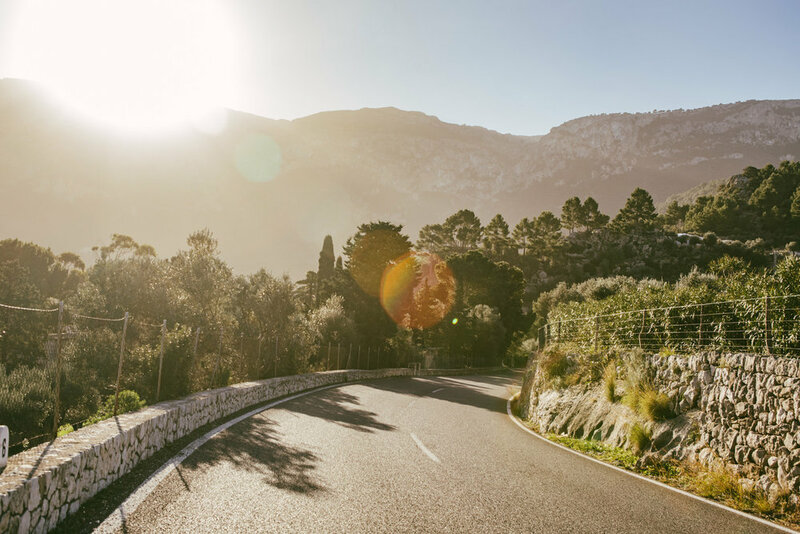 While you could obviously take the scenic routes and spend an entire day driving, it only takes about 1.5 hours to drive directly from coast to coast; so if you allow yourself enough time, you can experience a great deal of the island. Its waters are some of the most turquoise I’ve ever seen and it boasts limestone mountains and a coastline that will have you wondering where you even are. It is peppered with quaint little towns and coastal villages that are reminiscent of storybook fables, and it is home to sandy beaches and coves that are perfectly tucked away. A view of part of Deiá as the sunlight begins to spill over the mountains. Overturned boats at the entryway of Cala Deiá, photographed from one of the terraces. The main road that passes through Deiá is on the right, a road leading up to village neighborhoods on the left. Another angle of part of Deia, just before the sun began to spill over. 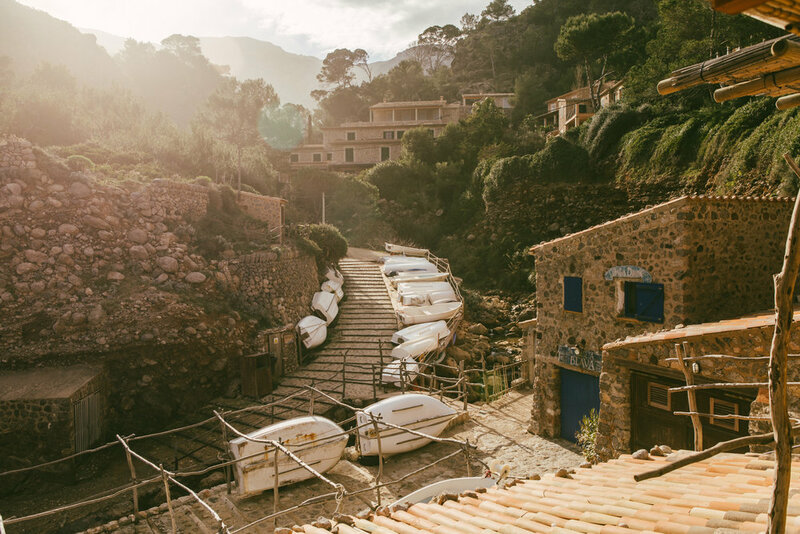 Perched in the Serra de Tramuntana mountains at the northwest coast of the island, Deiá is what one might call a moorish coastal village, elevated and unlike anything I’ve ever seen. 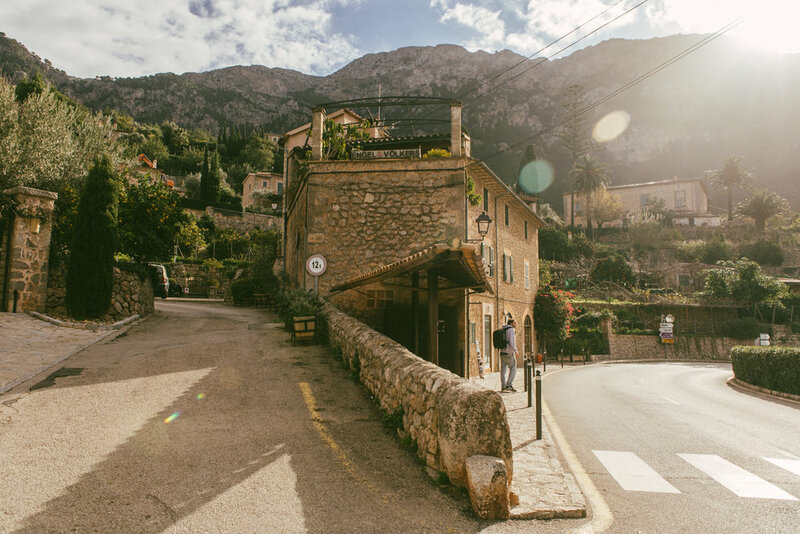 Historically, Deiá has seduced and captivated many artists and creatives with its terraced mountainsides, limestone buildings, and Mediterranean views, and it’s no wonder why it, along with the entire Serra De Tramuntana are recognized by UNESCO as a World Heritage Site. We arrived just before the sun spilled over the mountain tops, and as soon as light began to pour over, it kissed the rooftops and turned a cold, sleepy village into a remote golden getaway. Down at the base of the of the village is Cala Deiá, a rocky little beach that I’ve read has clear waters in the Summer. Sadly, the waters were brown when we visited as a result of the high tides churning up the mud below, but the waves were fascinating to watch as they crashed violently against the terraces and rocks — and they were sizeable. As timing would have it, the light was making its way down to the beach while we were there, and it made for the perfect little picturesque display of overturned boats and the wooden walkway. One of the best things about a Winter visit is there isn’t a sea of tourists to mar pretty scenes like these. Once you pass Deiá coming from the west, you can look left and back to the views and find this stunning piece of coast. Before hitting Deiá on the MA-10, you drive around a point of land that extrudes, and you can catch this view. We left Porreres at 9am and caught this scene of the sun on the road at about 10am. A village in the Serra de Tramuntana, visible from the MA-10. This drive is so stunning, I’ve read that some people consider it to be more beautiful than the drive through Big Sur, California. Although I beg to differ, it’s not because I think the Big Sur drive is better, I just find them to be equally remarkable for different reasons. I think a big part of what really struck me about cruising the MA-10 other than the ocean and mountain views surrounding, was the little villages that we’d pass by, nestled into the ravines of the mountains. They feel so different from the types of houses you’d see on the coastline somewhere like Malibu, for instance. They make you feel as though you’re traveling back in time, like you’re looking at a snapshot of the way life once was when things were simpler, before streetlights and glass buildings, when the only food a family had was what they farmed. A lot of the villages sit on farmland, after all — abundant with olive groves, lemon trees and orange trees, to name a few. View of Caló Des Moro from up top, close to where you’d park. It’s a quick hike down to the beach. The view from the little docking cove behind Caló Des Moro. Amazing formations behind the beach. Docking cove behind the beach. A closer look at the formations behind the beach. While heading back up to the street level we noticed these gorgeous cave formations at the back of the beach. A closer look at the beach from the opposite end. While apparently this beach is packed during the Summer months, we shared the sands with no more than 25 people. Near the southern tip of the island, you park at the elevated street level, and it’s a quick hike down to the beach. We took a staircase to the right of the main viewpoint where the first photo was taken. 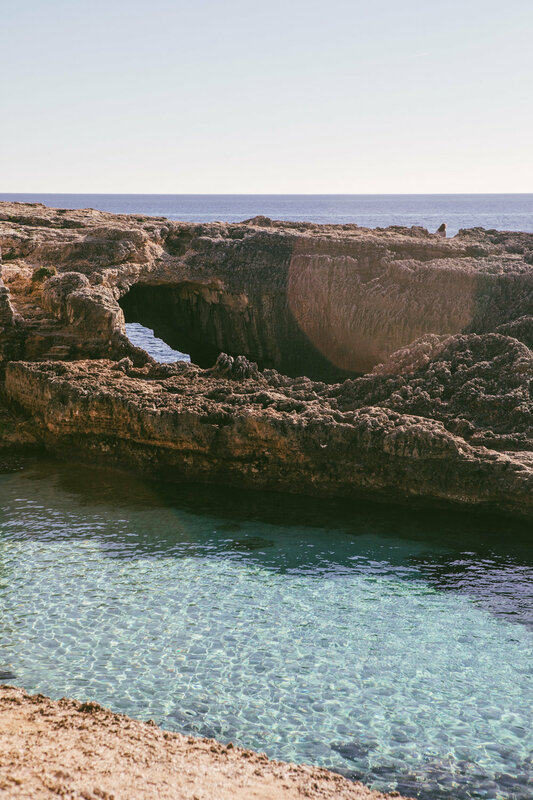 Once you get to the bottom of the staircase, you are greeted by sparkling turquoise waters, striking limestone formations, and a little docking cove that you have to walk behind to get to the actual beach. Make sure to wear shoes or sandals with a sturdy sole, because the surface can be sharp in some places. We laid our blanket on the beach and picnic’ed on the sand, a perfect way to spend New Year’s Day. I suggest getting there early, because the sun passes over the sand quickly, and it was covered mostly in shade by about 3pm. Partial 360 view of where we sat down to have some tea in the middle of the market. This market happens every Wednesday and Saturday in the village of Santanyí, and it’s where we found the best olives I’ve ever had! As someone who really didn’t care for olives not even a year ago, I’ve had some amazing olives in different countries surrounding the Mediterranean Sea that have completely altered my perspective. I now love trying (and consuming in very large quantities) different olives that have been marinating in herbs and spices! A few feet from where we were seated in the first picture above was the olive stand where we bought these delicious olives (they were spicy with chilis, herbs, and garlic), and I honestly wish we bought more since the market only happens one day a week! I’ll be honest, this market isn’t the best for shopping — it’s a lot of fake designer bags and cheaply made items — but it has lots of fresh produce, a range of fresh charcuterie, delicious olives (obviously), and a few stands with sweaters and tops locally made with nice fabrics. It’s a pretty small market (in the Winter, at least), so if you’re just looking around and not stopping at any stands you can probably get through the whole thing in about 15-20 minutes. BUT, considering the fact that most restaurants and cafes everywhere else on the island were closed during the time that we were there (off-peak season + holiday season), we were really happy to find a concentrated area bustling with lively restaurants and cafes for us to choose from. View of Cala Santanyí from the elevated walkway on the righthand side of the beach. Little entryway with green fences. Beyond the entryway you can see the docking area. This beach is really close to the Santanyí Market (about a 7 minute drive away), so we ventured here on a Wednesday right after the market. Again, there were no more than about 25 people there, and there is a little elevated pathway on the righthand side of the beach that takes you along the waters to a docking area, in between which, if you’re looking for an even more secluded experience, there’s a quaint little entryway with a green fence and limestone formations that you can lay your blanket or jacket on, have a seat, and watch the ocean waves and people. It was quiet and serene, and the sun hits directly overhead in the afternoon, for some prime sun-basking. The outer edges of the Palma Square boasts many great little restaurants and cafes. Part of the main shopping areas in Palma. A closeup of some of the detail work of the Palma Cathedral. A wall of chilis and garlic in one of the cafes! You can’t visit Mallorca without spending a day (or at least half a day) in Palma. 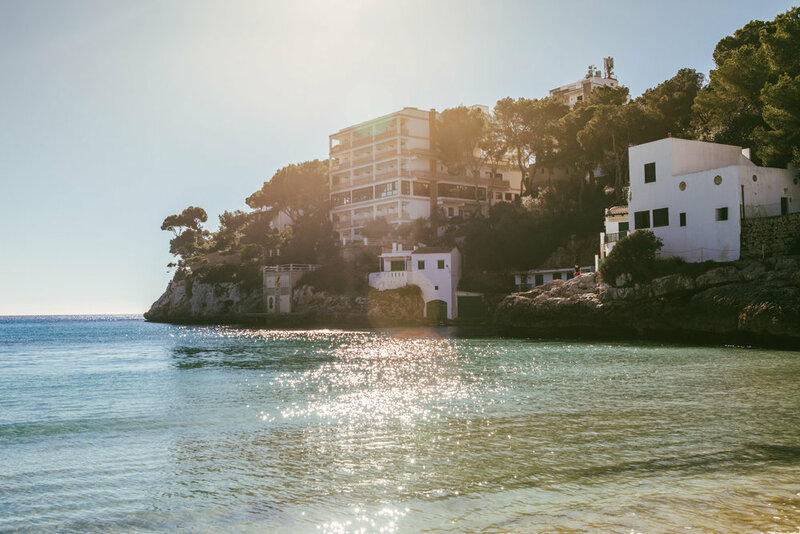 It is the capital city of Mallorca, the largest city in the Balearic Islands, and in the Summer, it is crawling with tourists and affluent members of the yachting community and their workers. The beach clubs are swarming, the fancy cars are out for show, and there is a bustling nightlife scene. In the Winter, though, while it is definitely still the liveliest place on the island where you will find most of the tourists and a much larger number of open shops, restaurants, and cafes, it is still fairly quiet. Even if all the outdoor tables at a cafe are taken, wait 10 minutes and something will likely open up and you can enjoy a nice cup of tea in the sunshine like everyone else. I, personally, prefer the very edges and outskirts of Palma Square to the actual center of it, because the center has a lot of shops and stores that you’d find elsewhere. The Palma Cathedral sits at the heart of the city not far from the sea, and it gleams under the sun like a beacon of light. Its sheer size alone is enough to draw the eye, but its Gothic-inspired architecture and detail is what will keep your attention. Screengrab from a video we took of the sunset. While I can’t speak much of the actual happenings in the beach town of El Arenal, its pathway along the water is a great place to catch the sunset. There is a clear sightline all the way out to the horizon, lined with boats, distant hazy mountain silhouettes, and the a radiant reflection of the sun on the water. We spent a little time in wandering the streets of the town before golden hour, and I felt as though I could count the number of open establishments on one hand (mind you, we were there on the day of New Year’s Eve, so it makes sense for it to have been especially quiet). Nonetheless, the sunset cloaked the town in golds and oranges and reds, and I would absolutely catch another sunset there, regardless of how quiet (or busy) it is.